Fuquay-Varina held their 4th annual Teen Day Saturday, May 10 at the Fuquay-Varina Community Center and South Park. What an awesome program put on by The Town of Fuquay-Varina Police Department! As the mother of a middle schooler, it was great to hear that this was a “cool” event that all the middle schoolers and some high schoolers were attending. 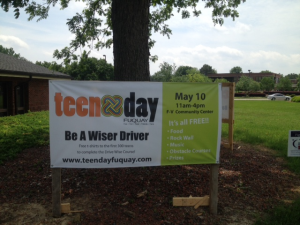 For the Town and our Police Department to take such an initiative investing in our future drivers is huge! There was free pizza, free t-shirts, and driver simulation activities to show teens what it feels like to drive while impaired or texting. The music and DJ were great; they delivered a low key, non-preachy, message to the young adults about how serious this matter is. My teen even came home with her friends telling me that they signed the pledge banner to Never Drink or Text While Driving. Thank you Fuquay-Varina Town Police; FRONT PORCH REALTY will definitely help sponsor this program next year!